How Social Media Supports Content Marketing | 8x8, Inc.
Well firstly, social media and content marketing do not work in silos. Instead, they are interlinked and essential for online business success. In fact, Smallbiztrends reports that 1 in 3 consumers check social media for information on brands in order to make informed buying decisions and 41% of small business owners say they depend on social media to generate revenue. Content marketing refers to all content like blog posts, designed images, videos, GIFs and so on that are created by brands and brought online for public consumption, and is aimed at nurturing a specific audience for a specific purpose that may or may not result in direct sales, but does long-term. Social media, on the other hand, is used by most people all over the world and has exceeded the reach of traditional media. Marry the two concepts, and you have a perfect balance to get a story out online to a huge amount of people who would not have been aware of your brand with traditional marketing efforts. We come back to the question: how does social media support contenting marketing? It is clear that the two work hand-in-hand in that social media ensures that created content reaches the maximum amount of people, either organically, or through advertising. 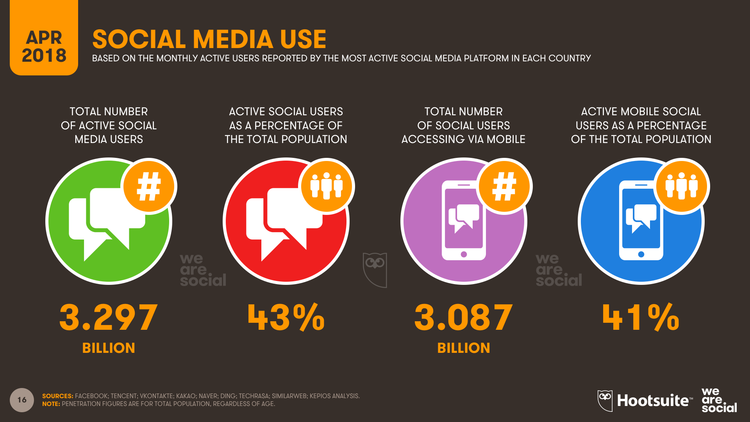 Social media has grown extensively over the past decade, with more than 3 196 billion users over various platforms.and is accessible to anyone with an internet connection. The driver behind social media is content - blog posts, images, videos, GIFs, infographics, white papers - and to keep current customers and attract new ones, it is important to produce high-quality content that is interesting and informative, and which matches the social media platform’s primary usage. Twitter with stats of 500 million tweets per day is used for broadcasting. This means letting followers know when new blog posts are created, or to give some kind of announcement. In addition, creating hashtags unique to a specific product, service or business, accomplishes increased exposure. Twitter is also used as a customer service touch point by many people, so brands must ensure they monitor and respond to relevant conversations. Facebook with 2.27 billion users by the last quarter of 2018, is graphic in nature and focuses mainly on entertainment; video does best on this channel. Facebook is ideal for small businesses who can share their content and product information cost effectively without splurging on a website. The messenger option also allows for direct engagement with customer and. Facebook Insights is a valuable tool when planning content. Instagram is the visual go-to social media platform that offers a benefit of access to 1 billion users. With the captions option, use of hashtags and ability to add up to 10 photos or videos per post, it is a sure way to build a brand. As they say, a picture is worth a thousand words and Instagram proves this true. The key to getting maximum results is matching the goal of each social media network’s goal together with the needs of the brand’s audience. Because of its nature and that it does not involve face-to-face interaction, online marketing is trust generated. It is unusual that any website will generate sales from the first visit because trust has not yet been earned. As long as it's done properly, content marketing on social media, achieves trust. To this end, content has to be planned around a long-term vision, and viewed as a long-term mechanism of indirectly influencing sales. On social media, engaging with your audience is vital and builds trust. Avoid the temptation of plonking content on a social media network and forgetting about it. If people make comments, respond to each one. Engagement tells your audience that you are active on social media and that people have access to a human that represents your brand online. On a side note: never delete a complaint. It will not go away by sweeping it under the carpet. In fact it may backfire and will make people question your integrity. The best thing you can do in the line of fire is respond honestly. It’s best to make someone in the team responsible for social media content and interaction. Social media supports content marketing by driving customers or potential customers to the brand’s website. For example, when a blog post is uploaded to the site and the link uploaded to social media, interested people will click to read it, and that results in a click to the website. However, it is of utmost importance that blog post content be valuable to the right audience, or people will simply click away fast, and that is bad for the website’s search ranking. Also bear in mind, that only adding a link to a blog post is not likely to get much attention, so an image that is relatable to your audience is crucial. 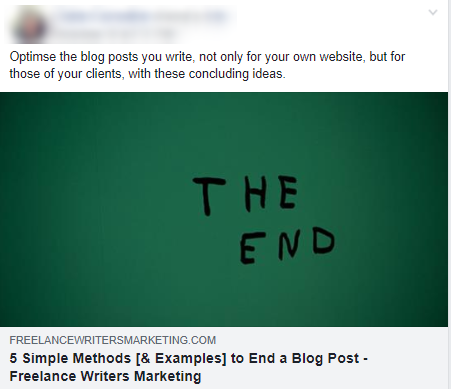 Example of an image used to promote a blog post on Facebook. In the same way, it's impossible to sell meat to a vegetarian, to be more effective, it’s important to know who you are trying to attract. Traditional marketing made it hard to get this kind of information, but tracking and insights for advanced targeting in order to optimize content efforts is made easy with the analytic features offered by each social media network. Some channels allow advanced targeting advertising, and this translates to greater reach and more effective marketing campaigns. Narrow down target market to a geographical area, demographics and even behavior. Online advertising comes with great perks and is significantly cheaper than traditional advertising, allowing even the solopreneur the ability to advertise online. There are no printing or distribution costs, or the fluctuation in prices according to peak hour broadcasting time as is the case with radio or TV advertising. Each social platform has structured pricing and your bill is dependent on the type of campaign. Building an online community using social media to support content marketing should be every brand’s aim, but it does require foresight, vision, planning and commitment. Building a community means a two-way conversation, but it also means greater loyalty, increased trust, higher conversions and customer retention. In addition, setting up communities like Facebook Groups gives brands tremendous insight into their customer’s needs, wants and behavior, and knowing these things empowers brands to get better marketing results. Social media marketing is a great way to increase sales, but it does take time to get going, unless of course, your brand’s budget allows for a lot of advertising. To boot, because online marketing is always about building trust, which takes time, content has to be strategic, planned, and offer value to the right audience. UCaaS (Unified Communications as a Service) software like 8x8’s ContactNow offers tremendous value when it comes to contacting leads generated by social media advertising. Calls can be made from anywhere in the world so brands can use freelancers or team members based in any location. In addition, sales reps can set up video calls and the whole team can use the software for collaboration. UCaaS software also allows brands to service customers directly from social media channels. To generate online sales, building trust is critical, and content marketing via social media, when done right, achieves this. Your sales and marketing teams need the best technology to be as productive as possible. With 8x8’s Virtual Contact Center you get world-class technology and everything your domestic or international business needs all in one system. Call 1-866-879-8647 or fill out an online form to request a no-obligation quote from an 8x8 product specialist.